Freeling is approximately 91 square kilometres in size and is 56km from the Adelaide CBD. The total population in 2011 was 1,927 which has seen a 17% increase in population in 5 years. 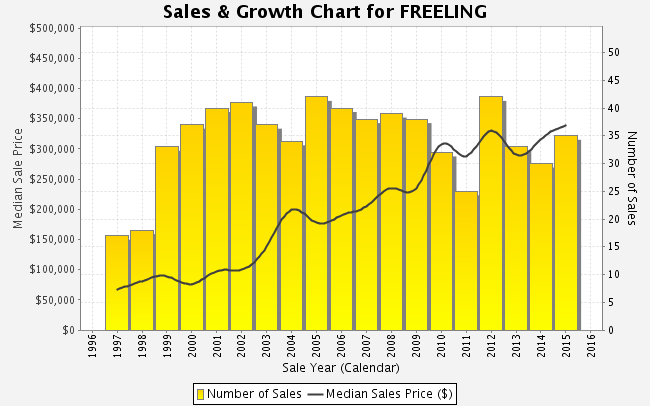 The average age of people living in Freeling is 40-59 with 55% being families and 45% being singles. The median price is approximately $328,000. The township of Freeling was surveyed in March 1860 by Robert Stephenson. It was named after Major-General Sir Arthur Henry Freeling, Surveyor-General of South Australia from 1849-61. Freeling was a stopping place on the Gawler to Kapunda railroad, which opened in 1860. The Freeling Hotel was founded in 1863, the Railway Hotel in 1867 and the St Petri Lutheran Church (now a private home) in 1871. By 1866, Freeling’s population numbered approximately 60. The major tourist attraction for the town and surrounding area is a popular Australian Drama television series, McLeod’s Daughters. The town has many sets used on the show, including the Gungellan Hotel (actually the Railway Hotel), Truckstop and Showgrounds. For more information on properties in Freeling call (08) 8522 4711 and speak to a local market leading agentwith the Ray White know how.